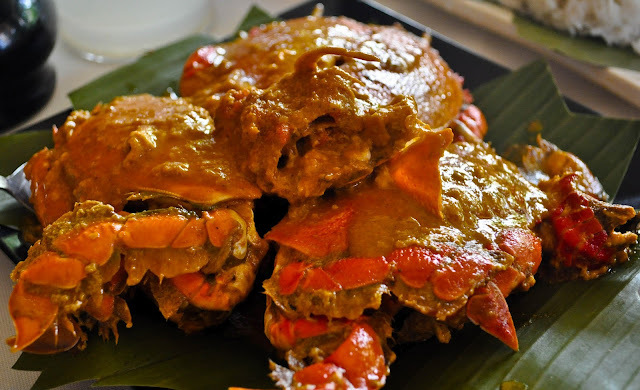 Zamboanga City, is famous for its dish called Curacha con Alavar Sauce. Curacha is a deep-sea crustacean found in the waters of Zamboanga, a peninsula in Southern Philippines, where amazing seafood abound. Alavar Sauce is another culinary highlight of Zamboanga. It is a delicious secret blend of coconut milk and spices served and sold in Alavar Seafood Restaurant. 1 Wash curacha or crab. Place in cooking pot. Set aside. 2 Place grated coconut in a mixing bowl. Pour water and mix. With your hands, squeeze all milk from the coconut. Set aside. 3 Mince garlic and ginger into tiny pieces. Set aside. 4 Sprinkle the salt, MSG, garlic and ginger all over the curacha or crab. Pour coconut milk all over the curacha or crab. 5 Turn stove on high heat until the coconut milk comes to a boil. Then drop the alavar sauce into the pot and lower the knob to medium heat. 7 When the coconut oil starts to surface, turn off the stove.